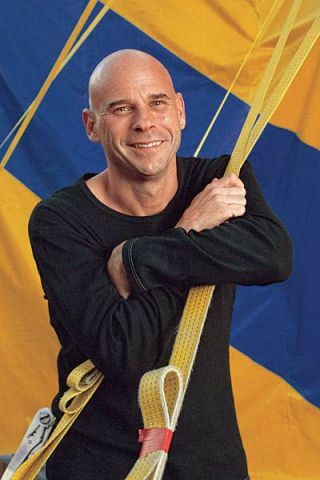 Canadian Guy Laliberté, founder of Cirque du Soleil, is set to become the next space tourist. Expect some professional flips and twists when Guy Lalibert?flies to space this fall. The Canadian acrobat and founder of Cirque du Soleilis set to become the seventhprivate space explorer when he lifts off Sept. 30 aboard the Russian SoyuzTMA-16 spacecraft. Lalibert? booked his trip with the Russian Federal SpaceAgency through the U.S.firm Space Adventures, which usually charges about $30 million for the excursions.Lalibert? is set to visit the InternationalSpace Station for about 12 days. Lalibert? is calling his voyage the "firstsocial/humanitarian mission in space," and says he is devoting his trip toraising awareness of worldwide water issues. In 2007 he founded the non-profitOne Drop Foundation, which fights for better access to clean water for peoplearound the world. "This is a mission that can make a difference and betrue to my personality," he said Thursday at a press conference in Moscow. "We need to provide access to clean water where it is needed." To get his point across, Lalibert? plans to carry up a poemhe co-wrote with a friend and read it from space. The piece is "a poem toplanet Earth and its inhabitants in regard to the situation with water,"he said. Lalibert? has named his mission the "Poetic Social Mission inSpace." Lalibert?, 50, is married and has five children. He iscurrently training in Russia's Star City cosmonaut training center to preparefor his mission. "The Russian Federal Space Agency really puts youthrough some tough tests," he said. "My main concern is to make surethat I am ready and I will not have to be babysat by my crew." Travelling into space represents a childhood dream,Lalibert? said, and he thinks the expense is absolutely worth it for theexperience he will have and the impact he can make. "I think this is one of the best investments anybodywill have done to promote the awareness of water," he said. "Everything I will get out of that experience, I will bite in it like in ajuicy apple." The last space tourist to fly was Charles Simonyi, aHungarian software executive who made his second paid trip to the space stationin March, also through Space Adventures. Lalibert? will be making the eighthspace tourist flight. Lalibert? could be the lastprivate citizen to travel to space for a while. If NASA retires its spaceshuttle fleet in 2010 as planned, the Russian vehicles will be the only way totransport people to the International Space Station. In that case, availableSoyuz seats could become scarce for space tourists. Lalibert? will be making the eighth space tourist flight (heis the seventh private spaceflyer, since Simonyi flew twice). He, like all theother private spaceflyers so far, opted not to participate in a spacewalk,which would have cost an extra $15 million. Lalibert? is part of Space Adventures' elite OrbitalMissions Explorers Circle program, which requires a $5 million deposit to join,and allows members to skip to the head of the waiting list when space touristopportunities become available.